Alfresco have many options to extend their document management system and one of them is to create a new document type as seen in the picture below. The new document is a Whitepaper, but we could have added other document types like a functional specification, meeting minutes, risk matrix and whatever that tingles our needs. 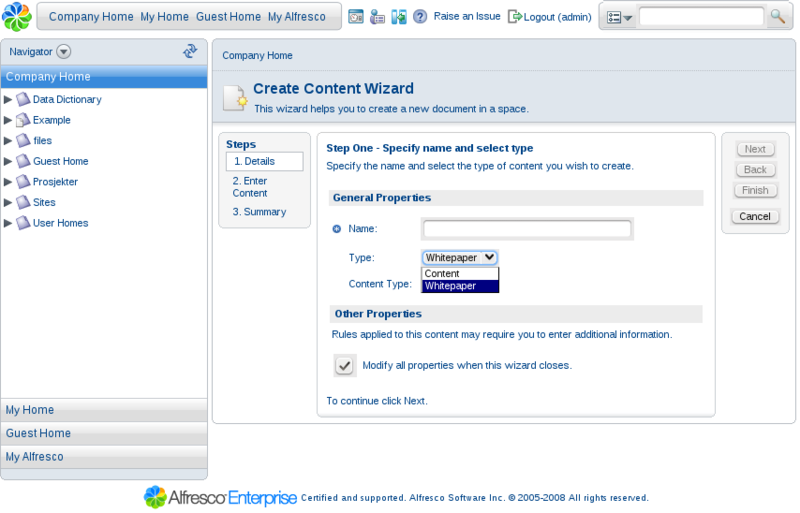 All documents that are uploaded or created in alfresco is by default marked as “content”, a generic term that can encompass everything. To create a document type is an easy way of setting documents apart/a way of categorizing and structuring the content itself. A developer can add certain functionality/behavior to a document type like a doc type having certain metadata connected to it, workflow (review, acceptance, publish), add versioning, that certain people shall be notified of changes or add permission so that only specific people can create and edit the document. One can add advanced search capabilities like searching for a specific document type. Do you know how to add custom fields to your doctype? Thanks for the post. Do you know how I can load word templates to a document library? I want to be able to instantiate a new document into my template based on a word template. i am stuck here and not add any content type to alfresco. Do you have any idea abouth this problem? I’m sorry, but I can’t help you. It’s about two years since I worked with Alfresco.